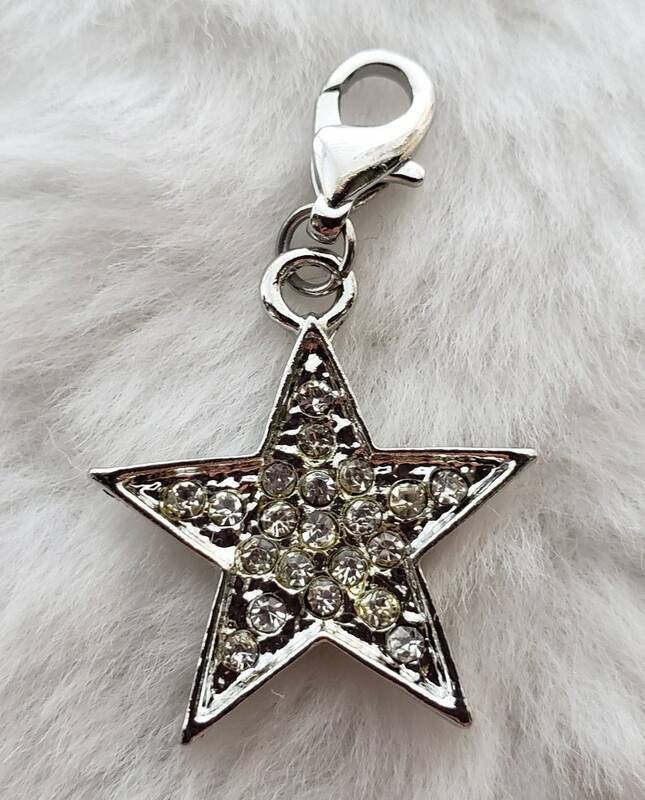 These sweet little sparkly rhinestone stars make a great addition to your success or celestial bracelet. Celebrate the fact that you are a shining star! Design your own charm bracelet, necklace or ankle bracelet! This charm comes ready-to-wear with a 12mm lobster clasp attached, unless you choose the "no lobster clasp" option. Made of lead-free, nickel free Tibetan silver and premium quality rhinestones. We also sell charm chains in any length you want, please check out our shop at www.foxibelles.com and look under the "Chains" section. Jewelry will be placed in a fabric gift bag. The bag will be mailed in a hot pink metallic padded mailer! Get 10% off your order when you spend $5 at this shop. Discount shown at checkout. Nice quality, blingy charms that will enhance just about anything. EXCELLENT QUALITY, great seller, quick delivery-PERFECT AGAIN! Thank you so much for the charms. GREAT COLOR, quality seller, excellent value, quick delivery-PERFECT! Thank you for the extra charms. All sales are final, unless you find a problem with the goods within five days or receipt. Please converse with us within 5 days of receipt so we can try to solve the problem. If we can't, you may ship the goods back to us and we'll refund your money. You MUST ship them via a trackable method and retain proof of shipping, as well as insure the goods as we are not responsible for loss or damage in transit back to us. We will exchange your item or refund your original purchase price minus shipping and handling charges as those are not refundable. Our shipping and handling fee includes USPS first class postage. USPS first class postage does NOT automatically include a tracking number. We are shipping from North Carolina so those on the east coast can expect their shipments within 2-4 business days. Those on the west coast may take up to 7-10 days to receive. We offer the option to upgrade to Priority Mail for an additional cost, and larger U.S. orders that pay $10 or more in shipping and handling will be upgraded to Priority Mail. Priority Mail offers 2-3 day delivery guaranteed. Sometimes the post office loses stuff. If you have not received your order within ten days of shipping (you'll receive an e-mail when your order ships), please contact us. We will send out a replacement. IF the USPS charges you more shipping when the package arrives, please contact us. This happens infrequently, but it does happen and we will want to hear about it. We apologize for the high cost of international shipping! The United States Postal Service now requires even the tiniest shipments of jewelry to be sent as "packages," rather than "flats/large letters," and that has quadrupled our international shipping and handling charge. We aren't happy about it, but the cost to ship international packages is high! If you feel your shipping charges are too high please send us a message before ordering and we'll let you know what we can do to work with you. PLEASE UNDERSTAND how expensive USPS shipping is now, plus we have to pay % fees to Etsy both for the sale of the item and the use of their credit card processing service. It adds up, and we try to charge a fair shipping and handling charge to cover our costs. We want you to be delighted with your purchases! If you can't give us a top five star rating on Etsy after your purchase, please let us know what we can do to earn one!